I've worn Helly Hansen's Velocity fleece during a March trip to Snowdonia (researching a route from Pen-y-pass across Crib Goch to Garnedd Ugain and Snowdon before heading back to Llanberis via Moel Cynghorion and Moel Eilio) when the conditions were pleasantly warm in the valleys but certainly not so during some of the higher reaches of my walks. The Polartec 200 fabric has a lovely soft feel and is extremely comfortable to wear. The Velocity fleece fits well, both body and sleeves are a good, generous length. I think it is pretty true to size - I was wearing the XL. The front fastens right up to the top of the amply sized collar. The zip itself isn't too thin and has a decent sized toggle big enough to get hold of when wearing gloves. There's a small amount of elastication around the bottom of the sleeves and the bottom hem. There's no draw-string adjustment possible at the bottom hem - which I was quite happy about as I often find a multitude of toggles a little annoying. There are two outer zipped pockets - each with a soft, warm lining material - great for storing keys, camera or 'phone. On the inside there are two inner sections - the back of the external pockets so not officially pockets as such - that however were fine for keeping an OS map. The only means of ventilation is the front zip. However I thought the Polartec fabric was quite breathable so I was certainly comfortably warm even in a light to moderate wind. So far it's washed well and there's no sign of any pilling. My only gripe about the Velocity is that although it's light, it is a little bulky which is a consideration if you just want to keep it at the bottom of your back pack 'just in case'. 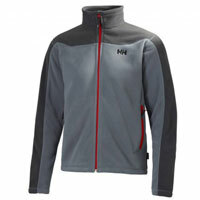 The Velocity from Helly Hansen is a good value mid layer, working well in combination with a breathable base layer and waterproof outer shell for year long use in all but the coldest conditions. It's understated styling make it also a great option for more general leisure wear.